She got her MW from GOG while I have the version from the collector edition from a few years ago, which meant I installed the game from CD. Might this difference be the problem? If you know anything please let me know, thanks! P.S: sorry for clunky english, I'm an Italian spaghetti, don't speak-a-inglish-a. What's your operating system? If Linux, try run with sudo (on Windows it's "run as administrator" or something). Also do you know how to run the game from console? If you do, you should be able to see which file it fails to load there. Oh, right, sorry. I'm running this on Windows 10. I already tried to run it as administrator but it didn't seem to affect it at all... 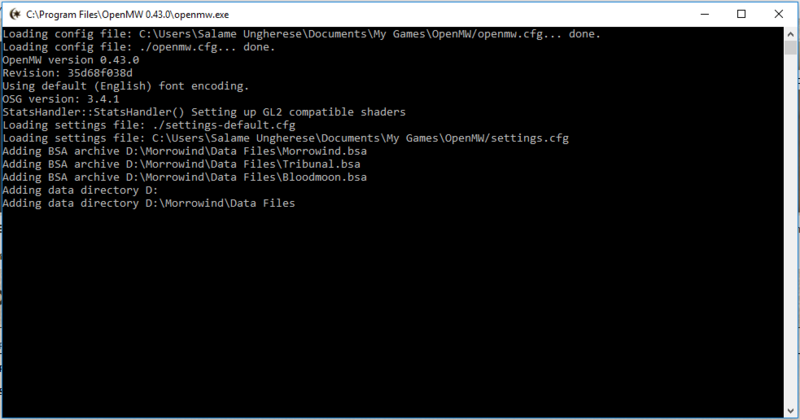 Unfortunately I don't know how to run a game from console, however the game DOES show a console when it opens, not sure if it'll help but I'll leave a screenshot here, just in case. This PC was made by a friend. He put 3 different HDs in it, one for games, one for programs, the other for systems. I put OpenMW on a different HD than Morrowind. That, for some reason, apparently created this "access" problem? I managed to fix it. In any case, thanks a lot for your time and sorry for not trying this sooner. No problem, glad it works now, it's good to have this solution posted here for people whom google may bring here in the future.